Nemarluk is a locality in the Northern Territory of Australia located about 210 kilometres (130 mi) south-west of the territorial capital of Darwin. It consists of land bounded in part by the Daly River and the Timor Sea in the north and north-west respectively, in part by the Fitzmaurice River in the south, and in part again by the Daly River in the east. Nemarluk is named in commemoration of Nemarluk (circa 1911 -1940) , an aboriginal man notable as an “Indigenous resistance fighter”, a murderer and as a prisoner. The locality’s boundaries and name were gazetted on 4 April 2007. The 2016 Australian census which was conducted in August 2016 reports that Nemarluk had 131 people living within its boundaries. 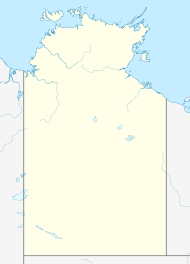 Nemarluk is located within the federal division of Lingiari, the territory electoral division of Daly and the local government areas of the Victoria Daly Region and the West Daly Region. ^ a b c d e f "Place Names Register Extract for Nemarluk". NT Place Names Register. Northern Territory Government. Retrieved 26 March 2019. ^ a b Australian Bureau of Statistics (27 June 2017). "Nemarluk (State Suburb)". 2016 Census QuickStats. Retrieved 26 March 2019. ^ a b c "Nemarluk Postcode". whatpostcode.com.au. Retrieved 26 March 2019. ^ a b c d "Nemarluk". NT Atlas and Spatial Data Directory. Northern Territory Government. Retrieved 25 March 2019. ^ a b "West Daly Local Government Area (map)" (PDF). Northern Territory Government. 28 May 2014. Retrieved 25 March 2019. ^ a b "Division of Daly". Northern Territory Electoral Commission. Retrieved 26 March 2019. ^ a b "Federal electoral division of Lingiari". Australian Electoral Commission. Retrieved 26 March 2019. ^ a b c "Monthly climate statistics: Summary statistics PORT KEATS AIRPORT (nearest weather station)". Commonwealth of Australia , Bureau of Meteorology. Retrieved 26 March 2019. ^ Shaw, Bruce (2000). "Nemarluk (1911? - 1940)". Australian Dictionary of Biography. Canberra: Australian National University. Retrieved 26 March 2019. This page was last edited on 23 April 2019, at 06:56 (UTC).